Ok, thanks. The issue is Linux specific (maybe applies also to Mac, don’t know? ), will have to fix that. @blndrusr A new version is available. The bug should be fixed now. Let me know if it still doesn’t work. It works fine now, and it’s brilliant Thanks a lot. One remark: a scroll-bar seems too thick. 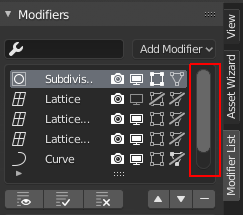 Scrollbars seem to be as thick in every list and there’s no way to change that. So that’s up to Blender devs. Thanks! Positive comments give me motivation to develop this further.